The lighting industry has a big education problem. Most people don't understand the numbers we use to characterize light; and besides, the numbers do a lousy job of it. We had a discussion in this community around Robin Miller's recent blog post, on the attitudes of interior decorators towards LED lighting. It got me thinking about what it would take to educate the public enough about lighting that the transition to LEDs could unfold in a smooth manner. Without a lot of disillusionment on the part of the public, that is. Robin's blog post profiled two decorators, one of whom is favorably inclined toward using LEDs in her residential and commercial projects, the other of whom is not. 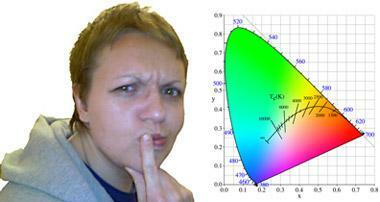 Reading between the lines, it becomes evident that neither decorator knows what CRI (color rendering index) is. Additionally, one of them shies away from correlated color temperature (CCT) as well. Now, it's impossible to talk in any detail about how LED light sources will perform in a given application without reference to CCT and CRI. If these decorators are typical, and there's no reason to believe they are not, they have good reason to be leery of selecting LED lighting for their projects: without the numbers, it's going to be a crapshoot as to how the light comes out. Decorators as a group are not the most technical of people, but they can be expected to have more sensitivity to color, light, and the harmony of interior spaces than the general run of the population. If decorators don't get the characterization of color, how can we expect the hoi polloi to get it? A recent discussion on the Innovations in Light group on LinkedIn pointed out how much deeper the problem goes. The original poster was Luc van er Poel, a senior lighting designer at Philips (sponsor of this site, and also of the LinkedIn group). He wondered how it was possible that light from a 3100K halogen could look significantly warmer than that from a 2700K LED. Aren't those CCT numbers hard and fast, Luc wondered? Boy, did he get an education (as did I). The first wrinkle, pointed out by Gordon Routledge, is that for light sources with a discontinuous spectrum -- LED, CFL, and HID -- the calculated CCT doesn't mean precisely the same thing as a blackbody radiator's color temperature. An LED light source's actual position in color space can be on the blackbody line, above it, or below it (yielding a blueish, pinkish, or greenish tinge, respectively) -- while still being accurately characterized as having a 2700K CCT. The deeper problem is that the instruments and the formulae used to measure and characterize light do not correspond to the human visual system -- at least not closely enough to avoid the kinds of color aberrations that give decorators fits. This was pointed out by posters Kevan Shaw and James Benya. As Shaw put it: "The issue here is the human eye is far better at color discrimination than any meter and at the end of the day we are (or certainly should be!) lighting for the eye and what you see rather than any numbers." Benya decried the "race to the bottom" in color rendering faithfulness driven by the singular emphasis on energy efficiency in LED lighting. With the exception of a couple of specialty suppliers -- he mentioned Soraa and Xicato -- most LED producers pay little attention to color rendering as long as they can hit a CRI of 80. But the efficacy numbers sure look good! So the questions that arise out of all of this are: How can we educate the clerk at Home Depot sufficiently that s/he does not misdirect consumers? And how can we change the course of an industry bent on squeezing every last lumen out of a Watt, to the detriment of the quality of light that results?